Rightly named for its unique call, the hoopoe is a beautiful bird whose song sounds like 'oop-oop-oop'. In this BirdEden article, we will provide a brief overview of this amazing avian, with information about its diet, habitat, migration, and much more. Birds from the hoopoe family have existed since prehistoric times. In fact, the oldest hoopoe fossil has been dated to the Eocene epoch (56-33 million years ago) along with the first ancestors of modern mammals such as horses, deer, rhinoceroses, etc. The hoopoe (Upupa epops) is a small, but colorful bird that is primarily found in parts of Africa, Europe, and Asia. 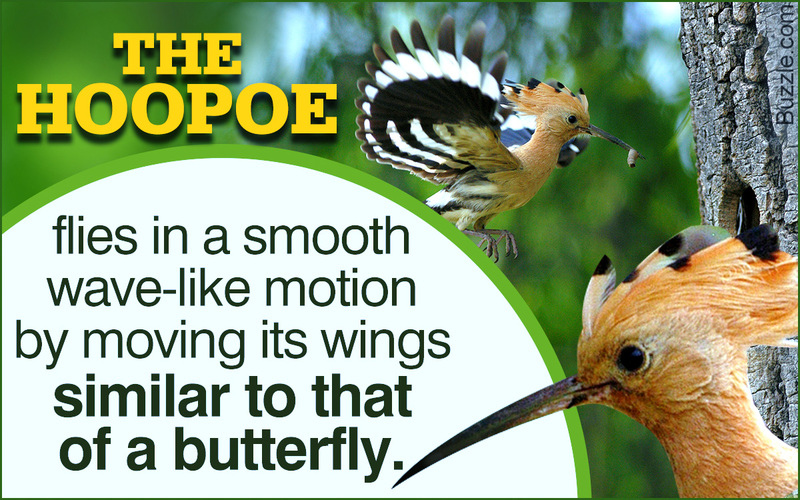 The name of the bird is an onomatopoeic one, which is taken from copying the 'oop-oop-oop' cry of the hoopoe. Characterized by its splendid crest and plumage, this bird has been adopted as the national bird of Israel. The hoopoe is a medium-sized bird with a body length of around 29 centimeters, and a wingspan of approximately 46 cm. Depending on the subspecies, the bird can weigh between 50-90 grams. The hoopoe has a long, black bill which has a light fawn color at the base. The bird also has broad black and white wings which enable it to be a strong flier, with a unique undulating flight pattern similar to that of butterflies. These wings also allow it to climb to great heights very quickly and also make tight turns, which are useful for evading predatorial birds like eagles and hawks. The rest of its body can change from a bright rust to dull tan shades. It also has a prominent rust-colored crest on its head with black feather-tips. 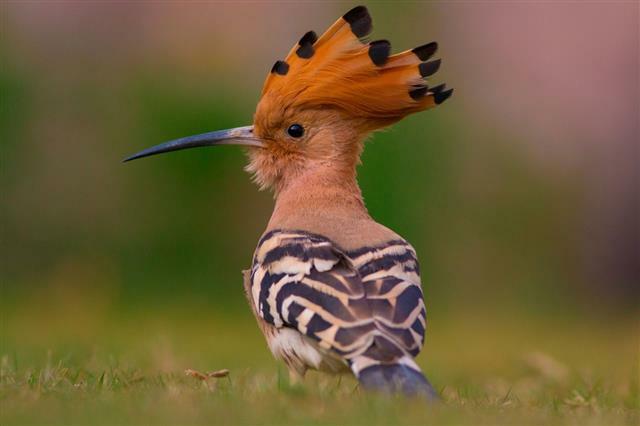 The crest of most hoopoes consist of exactly 28 feathers. Where do Hoopoe Birds Live? The various subspecies of the hoopoe are widely distributed across Europe, Asia, Africa, and Madagascar. This bird is also found on rare occasions as far as Alaska. The hoopoe prefers to live in areas with sparse vegetation, where it searches for food, and vertical surfaces such as cliffs, walls, etc., which it uses for building its nests. The Madagascar subspecies is known to make its home in dense forest regions. European hoopoes have been known to migrate north for breeding and in places like south England, during summers, due to the high numbers of insects available for eating. Hoopoes also migrate with seasonal movements depending on rainfall, in counties like Sri Lanka and India. Some of them have even been seen in the Himalayas at very high altitudes between 6,000-7,000 meters above sea level. The primary call of a hoopoe is 3-syllable 'oop-oop-oop', with rare 4-syllable usage. One can also observe croaks and hisses, when spotting predators or other sources of alarm. The females are known to produce wheezing cries during courtship rituals. Babies usually cry with a 'tiiiii' sound when trying to beg for food. What Do Hoopoe Birds Eat? The hoopoe's primary diet consists of insects. However, small reptiles, amphibians, and fruits, like berries, are eaten occasionally. During swarming seasons, the hoopoe will often hunt its pray in flight. On most other occasions, it will search for insects on the ground or in underground holes, by probing the ground with their long bills. This bird has very strong muscles around its bill, enabling it to be opened when probing below ground and procuring a wide variety of food like worms, crickets, larvae, ants, etc. This strong beak is also used to topple and search under large stones, strong tree barks and to probe through piles of dead leaves. Larger prey will usually be bashed against the ground or stones to kill them before ingestion. 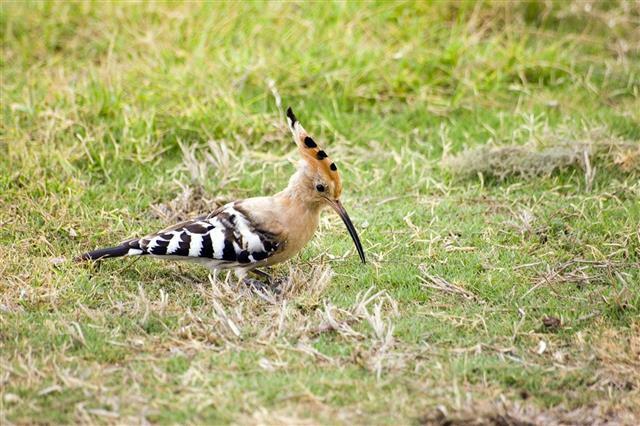 Hoopoes usually sing in various notes to attract mates. The bird stays with one partner throughout the mating and breeding season, and are highly territorial about their nesting spots, which result in brutal and bloody fights, which can end in serious injury. The pair will usually build a hole in a tree or wall with a narrow entrance, and line it with soft scraps and foliage, before laying approx. 10-12 light-blue eggs. The female will incubate the eggs for two to three weeks till the eggs hatch, while the male forages for food. The chicks take approximately another month before they can fly and take care of themselves independently. To protect the nest from predators, the hoopoes use a wide variety of defenses. The female produces a foul-smelling secretion from her glands, and coats the plumage of the chicks with it. This smell keeps predators and parasites away, while also acting as an antibacterial agent. Also, a week after hatching, the babies can shoot streams of their feces towards predators, while hissing loudly like a snake to scare them away. The birds may also stab with their sharp bills, and hit out with their wings, when threatened. The hoopoe is often found on the ground with their wings spread out and their tail spread on the ground, and their heads tilted back. Earlier, this was thought to be a defensive stance against predators. However, recent studies have shown this to be a stance of sunbathing, which is often accompanied by dust or mud baths. The diet of the hoopoe consists largely of insects that are considered as pests by man, and with a lifespan of around 10 years, each of these birds is important in keeping their numbers low. Therefore, many countries have set laws to protect the bird. Although the hoopoe is classified as 'Least Concern' by the IUCN, hunting in southern Europe and Asia is threatening this beautiful feathered being, which makes it important to step up conservation measures and laws to ensure that its numbers do not fall significantly.